Oregon state ballot Measure 97 has been one of the most contentious issues facing Oregon voters this election season. The measure pits the Oregon public employees against Oregon business interests over a future funding stream for education, healthcare and senior services. Measure 97 would increase the corporate minimum tax on C-corporations, charging 2.5 percent for sales above $25 million. If passed, the revenue would increase the Oregon State budget by one-third, adding an estimated $3 billion a year. Oregon currently has the lowest business taxes in the nation according to a 2015 Anderson Economic Group tax burden report. Governor Kate Brown gave her support to the measure as a means to stabilize funding for Oregon state services. Only a few states have corporate receipts taxes like the one proposed under 97: Delaware, Nevada, New Mexico Ohio, Texas, Washington and West Virginia. Some of those taxes are as low as 0.051 percent. Most of these tax rates are lower than the Oregon proposal because the tax applies more broadly to more businesses. Measure 97 is crafted to raise a larger percentage of taxes from a smaller pool of large corporations. The proposal has become the costliest ballot initiative fight in Oregon’s history with over $40 million raised by advocates and opponents combined. The effects of Measure 97 were analyzed by both the State Legislative Review Office and the Northwest Economic Research Center at Portland State University. The two studies used previous economic data to predict the effects of the Measure if it were applied in 2017. Both studies said Measure 97 would provide a modest amount of stability for funding, although less than in states that have sales taxes. Oregon voters have rejected a sales tax the nine times it has been on the ballot and is one of only five states without a sales tax. Oregon would continue to have the majority of its revenue come from income and property taxes which tend to follow the boom and bust of the market. Proponents say the state could hire over 7,500 teachers if measure 97 passes. Oregon has some of the largest class sizes in the nation. In 2012, only Arizona, California and Utah had fewer teachers for every 100 enrolled students. The Legislative Review Office report predicts higher wages for some public sector jobs that replace lower wage retail jobs. 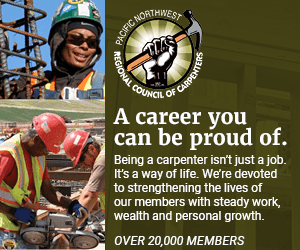 The Northwest Economic Research study says that construction, administrative and waste services, and professional and business services would all see employment increases under Measure 97. The two studies diverge when predicting how many jobs could be lost due to Measure 97. The Northwest Economic Research study says retail and wholesale trades, financial services, and manufacturing will all experience decreases in employment. Both studies said the effects of Measure 97 would be regressive -- meaning it would take a larger proportion of income from poorer families than from wealthier families. The amount of regressivity is marginal though, the LRO study predicted less than a 1 percent loss of income for any family due to higher prices. The Legislative Review study simulated this effect, predicting a $372 net loss of income for families making less than $21,000 per year and a $1,282 net loss of income for families making $206,000 a year. The $372 loss is 0.9 percent of income for the first family and the $1,282 is only a 0.4 percent of income for the wealthier family. Both analyses pointed out the dangers of “pyramiding” taxes. There are no exceptions to sales that are in a supply chain where the product would be taxed at every transaction if the companies are over the $25 million sales threshold. Manufacturing and food processing industries would more likely be affected by pyramid taxes. New Mexico, which has the highest gross receipts tax in the nation, between 5.125 percent and 8.9375 percent, has exemptions for supply chains to manufacturers. Since Measure 97 is a corporate sales tax and not a tax on profits, it would disproportionately affect high sales/low profit companies. Powell’s Books, Costco, wheat sellers Mid-Columbia Producers Co-op, DSU Peterbilt & GMC and others have said their businesses would suffer under the new tax structure. Who supports and opposes the Measure? The measure was put on the ballot by the non-profit advocacy group Our Oregon, which is largely funded by public employees’ unions. The Yes on 97 effort, also known as A Better Oregon, is a coalition of over 1,300 organizations, community groups and leaders as supporters. These include State Senator-Elect Lew Frederick, the Oregon Assembly for Black Affairs and the former PFLAG Portland Black Chapter -- now known as Sankofa Collective Northwest. The City Club of Portland favors the measure in a 7-4 split decision that acknowledges the measure’s flaws but supports adding needed revenue to state services. The measure has been getting national political attention as well. Sen. Bernie Sanders released a statement in support of Oregon’s measure. In an interview with the Huffington Post, Sen. Elizabeth Warren said she was watching the initiative closely and believes it is a step in the right direction. A number of business groups oppose the measure, such as The Portland Business Alliance, the Oregon Business Council and the National Federation of Independent Business/Oregon. The No campaign has a number of chambers of commerce, large and small businesses and many agricultural businesses voicing opposition. Many major newspapers do not support Measure 97 in their endorsements including The Oregonian, Willamette Week, The Portland Tribune and the Bend Bulletin. Former Gov. John Kitzhaber split from Gov. Brown and opposed the measure. In statement released on October 23, he agreed that schools needs more money but said 97 would not fix the fundamental flaws of spending in the education system. “The problem is that BM 97 proposes to spend an additional $6 billion a biennium on current programs; regardless of whether those programs are actually producing the outcomes we want,” he wrote on Facebook. Kitzhaber added data from an ECONorthwest education survey that shows Oregon having an average amount of spending per pupil -- 27th of of 50 -- compared to the rest of the U.S., but very low graduation rates.